Company Overview - Jinan Jinxiang Machinery Co., Ltd.
5YRSJinan Jinxiang Machinery Co., Ltd.
Jinan jinxiang Machinery Co., ltd is a professional machinery manufacturing enterprises integrate research and development, design and manufacturing, sales and service, which specialize in high quality XPS foam board line, polyurethane/phenolic foam board line and other auxiliary equipment. The "honesty, fairness and innovation" are our entrepreneurial spirits, "pursuing better products and service" is our management philosophy. 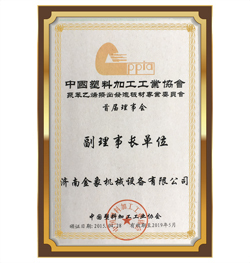 Based on the theory of the science and research are leading factors, profit and talent are foundation, our company devote to realize the overall solution of high-quality foam plate extrusion line and special shape profile line.Quality is the life of products while the credibility is the basis for cooperation. In return for our masses of users, we keep making innovations on technology and system, introducing the state-of-the-art technology and advanced talents, executing and carrying out international standards, selecting and purchasing key components from famous enterprises worldwide. Increasingly, Jinxiang brand products are acknowledged and trusted by customers at home and abroad. Our company will work hard to meet various requirements offering unique products and services for customers.Jinxiang people has experienced the fast-changing operational environment and had ability to satisfy individual requirements for customer. So we formed one professional team who are willing to dedicate themselves to develop the first-class product and provide top service for our customers. We are full of confidence for our future and hope to cooperate with you sincerely!